This is my attempt to save all the images from a word document to a folder. I write my blog posts in a word document first , for many different reasons, then I transfer them here. As part of that I need to convert all my images in my word doc to png image files. I have been doing it one at a time right clicking and clicking "Save picture as" but this is tedious, so I came up with this VB script to do it. Its not perfect, but for my purposes it works great. 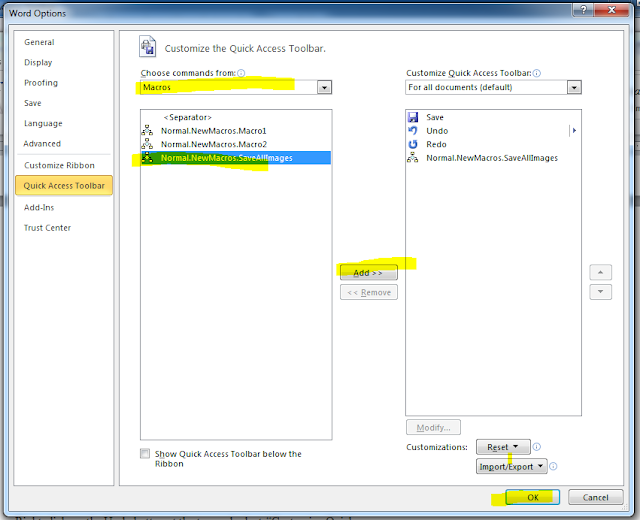 Give the macro a name and then Click on Create. 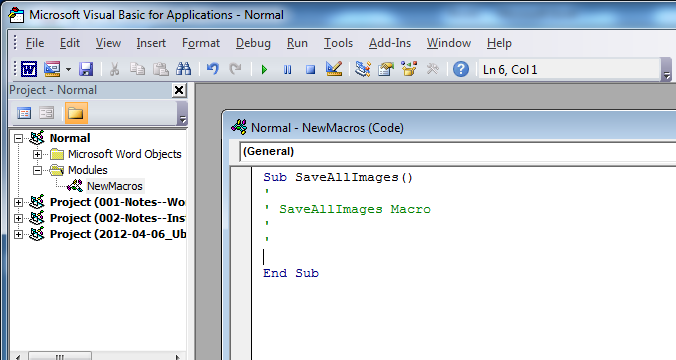 This will open up the Visual Basic Macro editor. TodayDateString = Year(Date) & "_"
TodayDateString = TodayDateString & "0"
TodayDateString = TodayDateString & Month(Date) & "_"
MsgBox "Saving Images to " & saveLocaton & FolderName & "_files"
Kill saveLocaton & FolderName & ".html"
Kill saveLocaton & FolderName & "_files\*.xml"
Kill saveLocaton & FolderName & "_files\*.html"
Kill saveLocaton & FolderName & "_files\*.thmx"
& prePendFileName & "_00" & x & ".png"
& "_files\" & prePendFileName & "_0" & x & ".png"
After saving my Macro I wanted to make it available as a button in Microsoft word 2010. I found a few sites like http://www.addictivetips.com/microsoft-office/word-2010-create-macro-button-and-access-it-from-quick-access-toolbar/  That show how to do this but it only is accurate if you are recording a macro. I already have a macro so I did the following. 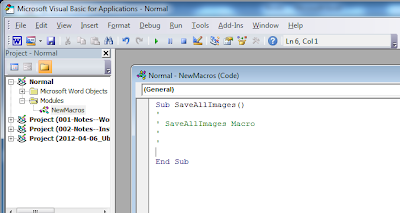 Select Macros, then select the macro to add, finally click OK.
Now that I have said all that I will write out a detailed description of what the code is doing. 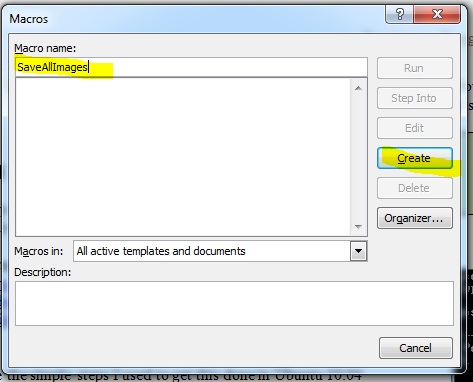 Save the full file name, this is used later to reopen the document. I take the name of the word document and I remove the “.docx” at the end and I remove the first 10 characters from the beginning. I have a strict way I name my files. You may want to adjust this to only remove the .docx or .doc . I have a set folder where I save my image folders to so I just hard code it in here. Again you may need to change this based on your needs. “YYYY_MM_DD”. This gets the current date and formats it like this. Sets the folder name and pops a message box. Just in case you run this program more than once on the same file, this will delete the prior made files and folder. Also the “On Error Resume Next” allows the program to skip on an I/O errors just as the file is not there. Save the file as an html document at the specific location, then close the document. Delete the .html document and the extra, non-image files that are made in its subfolder. I made two simple loops one to hand 1-9 and one to handle 10 to 99. This re-opens the document as a word format. Leaving it open as the html version bugged me that is why I closed it deleted the .html version then reopened it. Finally this sets word as the active (on top) program. Well that is it for my code, tweak away and make it your own. If I was going to do something like that I would just print to PDF then convert the PDF pages to png images. VBScript does not feel like the right way to go.